She took portraits of friends, family and local figures before working as a freelance photographer and touring Europe in the 1890s, using her connection to Smillie to visit prominent photographers and gather items for the museum's collections. She gained further practical experience in her craft by working for the newly formed Eastman Kodak company in Washington, D.C., forwarding film for development and advising customers when cameras needed repairs. In 1894 she opened her own photographic studio in Washington, D.C., on V Street between 13th and 14th Streets, and at the time was the only woman photographer in the city. She took portraits of many famous contemporaries including Susan B. Anthony, Mark Twain and Booker T. Washington. 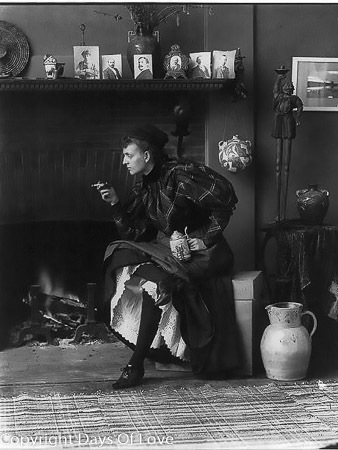 Well connected among elite society, she was commissioned by magazines to do "celebrity" portraits, such as Alice Roosevelt's wedding portrait, and was dubbed the "Photographer to the American court." She photographed Admiral Dewey on the deck of the USS Olympia, the Roosevelt children playing with their pet pony at the White House and the gardens of Edith Wharton's famous villa near Paris. Her mother, Frances Antoinette Johnston, had been a congressional journalist and dramatic critic for the Baltimore Sun and her daughter built on her familiarity with the Washington political scene by becoming official White House photographer for the Harrison, Cleveland, McKinley, "TR" Roosevelt, and Taft presidential administrations. Johnston also photographed the famous American heiress and literary salon socialite Natalie Barney in Paris but perhaps her most famous work, shown here, is her self-portrait of the liberated "New Woman", petticoats showing and beer stein in hand. Johnston was a constant advocate for the role of women in the burgeoning art of photography. The Ladies' Home Journal published Johnston's article "What a Woman Can Do With a Camera" in 1897 and she co-curated (with Zaida Ben-Yusuf) an exhibition of photographs by twenty-eight women photographers at the 1900 Exposition Universelle, which afterwards travelled to Saint Petersburg, Moscow, and Washington, DC. She traveled widely in her thirties, taking a wide range of documentary and artistic photographs of coal miners, iron workers, women in New England's mills and sailors being tattooed on board ship as well as her society commissions. While in England she photographed the stage actress Mary Anderson, who was a friend of her mother. In 1899, she gained further notability when she was commissioned by Hollis Burke Frissell to photograph the buildings and students of the Hampton Normal and Agricultural Institute in Hampton, Virginia in order to show its success. This series, documenting the ordinary life of the school, remains as some of her most telling work. It was displayed at The Exhibit of American Negroes of the Paris Exposition Universelle in 1900. She photographed events such as world's fairs and peace-treaty signings and took the last portrait of President William McKinley, at the Pan-American Exposition of 1901 just before his assassination. With her partner, Mattie Edwards Hewitt, a successful freelance home and garden photographer in her own right, she opened a studio in New York in 1913 and moved in with her mother and aunt. She lectured at New York University on business for women and they produced a series of studies of New York architecture through the 1920s. In early 1920 her mother died in New York. In the 1920s, she became increasingly interested in photographing architecture, motivated by a desire to document buildings and gardens which were falling into disrepair or about to be redeveloped and lost. As her focus in architecture grew, she became specifically interested in documenting the architecture of the American South. Johnston was interested in preserving the everyday history of the American South through her art; she accomplished this by photographing barns, inns, and other ordinary structures. She was not interested in photographing the grand homes and estates of the American South, but rather the quickly deteriorating structures in these communities that portrayed the life of common southerners. Her photographs remain an important resource for modern architects, historians and conservationists. She exhibited a series of 247 photographs of Fredericksburg, Virginia, from the decaying mansions of the rich to the shacks of the poor, in 1928. The exhibition was entitled Pictorial Survey--Old Fredericksburg, Virginia--Old Falmouth and Nearby Places and described as "A Series of Photographic Studies of the Architecture of the Region Dating by Tradition from Colonial Times to Circa 1830" as "An Historical Record and to Preserve Something of the Atmosphere of An Old Virginia Town." Publicity from the display prompted the University of Virginia to hire her to document its buildings and the state of North Carolina to record its architectural history. Louisiana hired Johnston to document its huge inventory of rapidly deteriorating plantations and she was given a grant in 1933 by the Carnegie Corporation of New York to document Virginia's early architecture. This led to a series of grants and photographs of eight other southern states, all of which were given to the Library of Congress for public use. In December 1935, she began a year long project to capture the less evolved structures of the Colonial Era in Virginia. This was effort was intended to be a one year project, but evolved into an eight year extensive project, in which she surveyed 50,000 miles and 95 counties in Virginia. Johnston was named an honorary member of the American Institute of Architects for her work in preserving old and endangered buildings and her collections have been purchased by institutions such as the Metropolitan Museum of Art, the Virginia Museum of Fine Arts and the Baltimore Museum of Art. Although her relentless traveling was curtailed by petrol rationing in the Second World War the tireless Johnston continued to photograph. Johnston acquired a home in the French Quarter of New Orleans in 1940, retiring there in 1945, where she died in 1952 at the age of eighty-eight. Lawrence, John H. "Frances Benjamin Johnston". Encyclopedia of Louisiana. Louisiana Endowment for the Humanities. Retrieved 21 February 2018. "Frances Benjamin Johnston – Biographical Overview and Chronology". Library of Congress. "Amateur Photographers' Club in Prospect". The Washington Times. 1894-09-02. p. 2. Retrieved 2011-12-10. Miss Frances Benjamin Johnston, of this city, has commenced tho erection of a studio on V street, between Thirteenth and Fourteenth streets, in which she proposes to make high-class photographs and prosecute to the fullest extent her study of photography. "Miss Alice to Wed". Amador Ledger. 1906-01-12. p. 1. Retrieved 2011-12-10. Lincoln Kirstein (1965-12-14). The Hampton Album (PDF). The Museum of Modern Art. Retrieved 2011-12-10. "Woman Pioneer of Newspaper Photographers Entertained Here, Where Her Work is Admired". The St. Louis Republic. 1903-10-15. p. 6. Retrieved 2011-12-10. The next morning she had secured a dozen plates of the Admiral. […] Far in advance of other photographers, Miss Johnston was back in New York and within a week every newspaper reader in America was enabled to gaze on Admiral Dewey in all the glories of his white duck uniform. "Photographing the West". The Minneapolis Journal. 1903-09-08. p. 6. Retrieved 2011-12-10. Miss Johnston excels in portraits, a notable instance of her skill being a full length photograph of President McKinley delivery his last address in Buffalo. "Woman and the Camera". The True Democrat. 1897-12-04. Retrieved 2011-12-10. Miss Frances Benjamin Johnston, the photographic artist, writes, in the Ladies' Home Journal, on "What a Woman Can Do With a Camera," telling the requisites for artistic and financial success in the pursuit of photography as a profession. "Chronology of Zaida Ben-Yusuf, 1898–1900". Smithsonian National Portrait Gallery. Retrieved 2009-03-30. Laura Wexler, "Black and White and Color: American Photographs at the Turn of the Century," in Prospects: An Annual of the American Cultural Studies' 13 (1988): 343. Anne Maxell, "Montrer l'Autre: Franz Boas et les soeurs Gerhard", in Zoos humains. De la Vénus hottentote aux reality shows, Nicolas Bancel, Pascal Blanchard, Gilles Boëtsch, Eric Deroo, Sandrine Lemaire, edition La Découverte (2002), pp. 331–39, in part. p. 338. ""Signing of the Protocol": Photos of the Noted Personages as the Historic Document was signed". The Evening Bulletin (Maysville, Ky). 1898-08-29. p. 4. Retrieved 2011-12-10. "Personal Mention". The Washington Times. 1912-12-09. p. 10. Retrieved 2011-12-10. 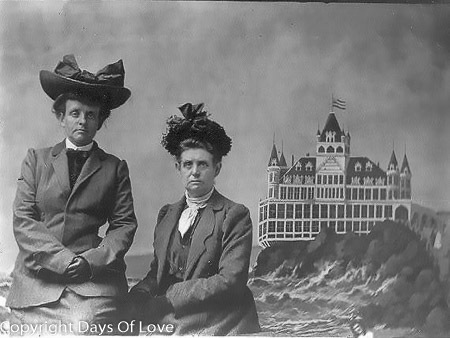 Miss Frances Benjamin Jonhston is spending a week with her aunt, Mrs. Saunders Johnston, of 1342 Fifteenth street, prior to dismantelling her house and studio in this city. Miss Johnston is now established in New York, where her mother and Mrs. C. J. Hugen will make their home with her. Maria Popova. "The Love Letters of Pioneering Victorian Photojournalist Fannie Benjamin Johnston". brainpickings.org. Gushee, Elizabeth (Spring 2008). "Travels Through the Old South: Frances Benjamin Johnston and the Vernacular Architecture of Virginia". Art Documentation: Journal of the Art Libraries Society of North America. 27 (1): 18. Barry Swackhamer (2012-01-06). "Frances Benjamin Johnston House". The Historical Marker Database. Retrieved 2012-04-30. Sam Watters (2012-03-01). "Biography of Frances Benjamin Johnston". The Cultural Landscape Foundation. Archived from the original on 2012-05-14. Retrieved 2012-04-30.